Shocks Happen: Are Retail Deposits the Answer? John Hill and Jeremy Chiu. In September 2007, Northern Rock became the victim of the UK’s first bank-run since 1878. Northern Rock had lost access to the wholesale markets on which it relied for its funding. Bank funding has remained a key issue for policymakers in the wake of the crisis, and has been the subject of new rules designed to promote funding resilience. Today, banks are more reliant on retail deposits for their funding, but this could present other issues for the dynamics of retail deposits that are less well understood. In this post, we introduce some of our own research that shows that banks are unable to raise deposits quickly in order to plug funding gaps opened up by adverse shocks. Like any business, banks need to have funds available in order to carry out their activities. These activities include lending to households and businesses. Banks can raise funds in a variety of ways. 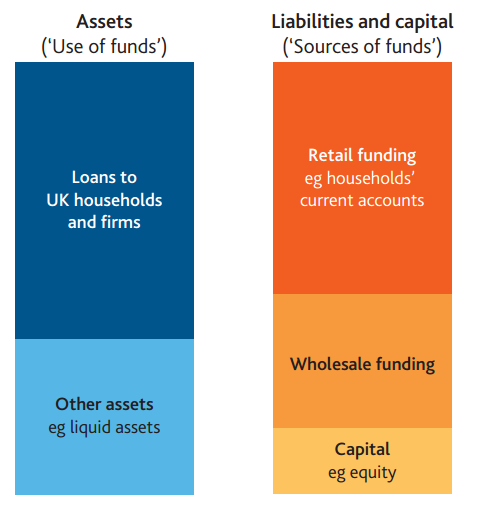 Broadly, we can divide the ways they raise funds into two types: so-called ‘wholesale’ funding – money borrowed from investors – and ‘retail’ funding, which is comprised of the fbalances households hold on deposit with banks in their savings and current accounts. Figure 1 illustrates these two types of funding in a stylised bank balance sheet. To continue to lend to households and businesses uninterrupted, banks need to be able to weather shocks that inevitably hit them from time-to-time. Resilient banks are able to recover quickly following such shocks. Adverse shocks to a bank’s funding can lead to a funding shortfall. The bank needs to fill this shortfall quickly so that it can continue to carry out its business activities. So when we say that a bank’s funding is resilient, we mean that the bank is able to take actions to mitigate such funding shortfalls. Later in this post we’ll discuss how effectively deposits are able to fill these shortfalls. Post-crisis, banks have shifted away from flighty sources of funds, such as interbank deposits and short-term debt. They have replaced much of this funding with customer deposits, which come predominantly from the household sector (Chart 1). New liquidity standards also incentivise banks to grow their share of retail deposits at the expense of wholesale funding. However, much of the recent academic research (for example, Acharya, Gale and Yorulmazer (2011), Damar, Meh and Terajima (2013), and de Haan, van den End and Vermeulen (2015) ) on the resilience of bank funding has focused on the resilience of wholesale funding. Unfortunately for us, models that are well-suited to studying wholesale funding typically do a poor job of explaining the dynamics of retail funding. This is because retail deposits have a number of unique features which collectively give rise to behaviour which is quite different to other types of funding. While investors are almost exclusively motivated by the return they can get on the funds they provide to banks, households consider a wider range of factors when choosing where to deposit their savings or current account balances. Households also care about the range of services our bank offers: we value the ability to make electronic payments directly from our accounts, and withdraw cash from a network of ATMs. Deposits are also subject to deposit insurance which changes their risk profile relative to other unsecured claims on banks. In the remainder of this blog post we introduce some of our own research that seeks to build a better understanding of the resilience of retail funding. To assess funding resilience we need a model which encompasses a range of shocks, and allows us to devise metrics (based on real data) to assess how quickly banks’ funding positions recover after shocks hit. As Bank staff, we have access to information about the deposit rates that banks offer, and the deposit balances they hold. We also have access to other publicly available data, such as banks’ credit default swap (CDS) premia and risk-free rates. To use these data to study funding resilience, we adopt a structural approach: we disentangle complex relationships from limited data by imposing an economic model and making some simplifying assumptions. Meanwhile, each bank chooses to fund itself with a mix of household deposits and ‘other funds’. We loosely refer to these ‘other funds’ as wholesale funding. Step 1 determines the relationship between deposit rates and the quantity of deposits supplied by households. This relationship is described by the deposit supply curve in Figure 2. It is positively sloped – households are prepared to deposit more with banks when deposit rates are higher. Step 2 defines the deposit demand curve. Its slope is negative – banks demand fewer deposits when they have to pay more for them i.e. when deposit rates are higher. The intersection of the demand and supply curves determines the market clearing price and quantity of deposits. We use this simple model to identify two types of shocks to banks: deposit demand shocks, and deposit supply shocks. For each type of shock, we also distinguish between shocks to all banks (aggregate shocks), and shocks which affect just one bank in the system (idiosyncratic shocks). This means that we model four distinct types of shock in total. 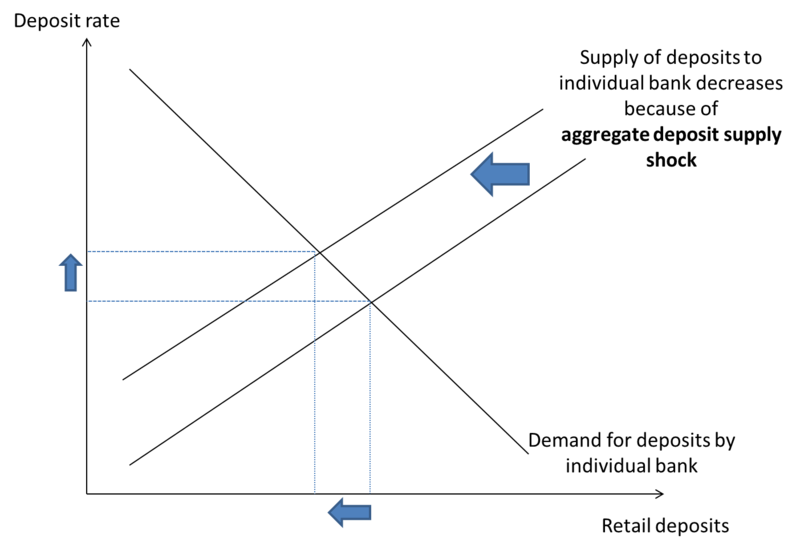 Figure 2 illustrates an aggregate deposit supply shock in the simple framework described earlier. An aggregate deposit supply shock has the effect of reducing the quantity of deposits that households are willing to supply for any given deposit rate. Intuitively, this might be because households become less risk averse and choose to allocate a greater fraction of their wealth to risky assets, such as equities. Using this shock identification methodology, we estimate the relationship between the change in deposits and the change in deposit rate under each type of shock. The modelling set-up we choose lets us impose shocks on banks such that they lose a specified amount of funding. This set-up also restricts banks’ responses such that they can only fill the resultant funding gap with retail deposits following shocks. They do this by bidding up for deposits. We find that banks are unable to close funding gaps quickly by raising deposits. Neither are they able to raise them cheaply. We estimate that deposit elasticities are typically of the order of 0.3. We should note that the nature of the relationship between deposit rate and quantity of deposits raised could be non-linear-and size dependent. For example, small banks may find they attract a very large (relative) increase in deposits by offering a small premium. This means that for every 1% increase in the deposit rate (on the stock of all outstanding household deposits), banks would expect the stock of their deposits to grow by only an additional 0.3% per annum, over and above what they would have grown by leaving deposit rates unchanged. It is important to note that these are percentage changes, not percentage point changes! So if the bank’s initial deposit rate was 200bps, a 1% increase takes its deposit rate to 202bps. We also show that banks find it hardest to raise deposits when they face an aggregate deposit supply shock – that is when the household sector as a whole reduces the amount of deposits it supplies to the banking system – while demand for deposits remains the same. And this result would likely be even stronger if our model were developed further to account for feedback effects between banks. 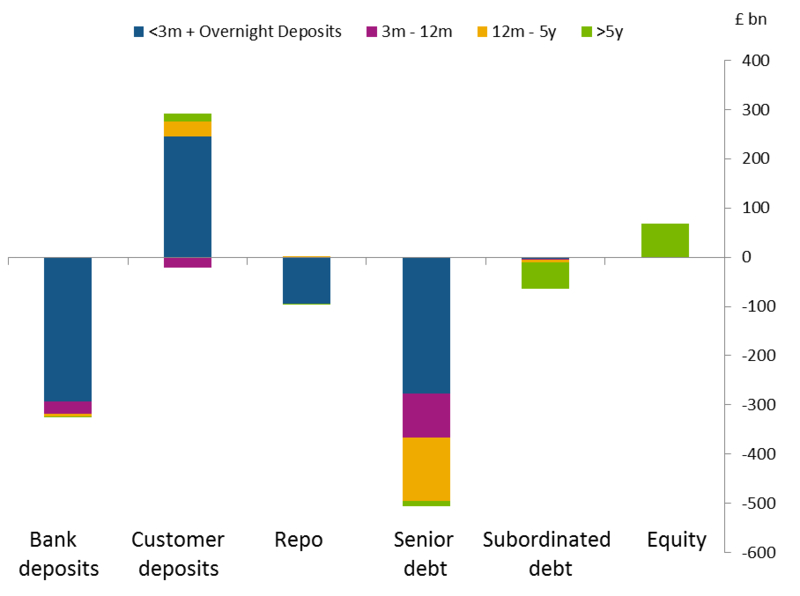 In the simplified deposit market we model, the aggregate quantity of deposits is fixed. In other words, we assume that banks are collectively unable to induce households to hold more deposits, in aggregate, by increasing the aggregate deposit rate. While this is a simplification of reality, indeed there could well be an expansion of deposits rather than zero-sum competition; there are a number of frictions that could prevent households from substituting risky assets for deposits. In a world in which these frictions are large, if all banks try to raise deposit rates simultaneously, they could effectively play a game of ‘hot potato’ – passing their funding gaps to each other. One bank raising deposits, by definition, results in another bank in the system losing deposits. In theory, this could lead to a situation in which banks are bidding up for deposits, but not all banks are successful in closing their funding gaps. The individually rational response of each bank (to raise its deposit rate) could lead to sub-optimal outcomes for the banking system as a whole. This is a good example of a macro-prudential risk. We are confident that banks’ funding structures are more resilient to the types of shock that they faced during the crisis. But we think that we need to reach a better understanding of risks that could manifest if banks seek to plug a funding gap by raising additional funds in the deposit market. In particular, researchers need to develop new ways to assess the potentially dangerous spill overs that could occur when all banks demand deposits at the same time. John Hill works in the Bank’s Banking Analysis and Support Division and Jeremy Chiu works in the Bank’s Conjunctural Assessments and Projections Division. Next Post Less is more: what does mindfulness mean for economics?